A favourite pastime on Cribbit is 'magnet fishing' and some remarkable 'fish' have been landed over the years. 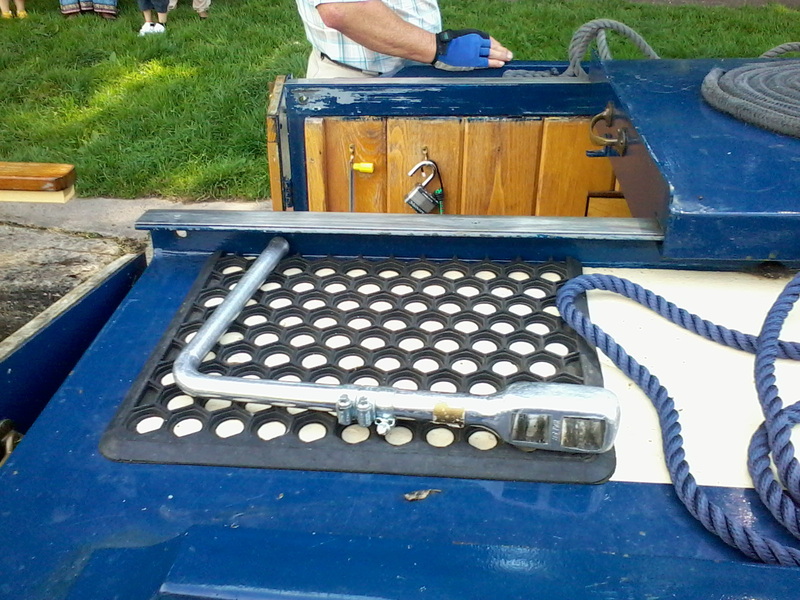 There is one piece of [expensive] equipment for which the magnet would be useless if lost overboard. This is my aluminium Dunton windlass. Users of this are usually threatened with the plank should they drop it and so far this measure has proved to be successful in keeping it safe. On the Caen Hill flight, our companion nb Day Dream, had a Dunton with steel jubillee clips on it. 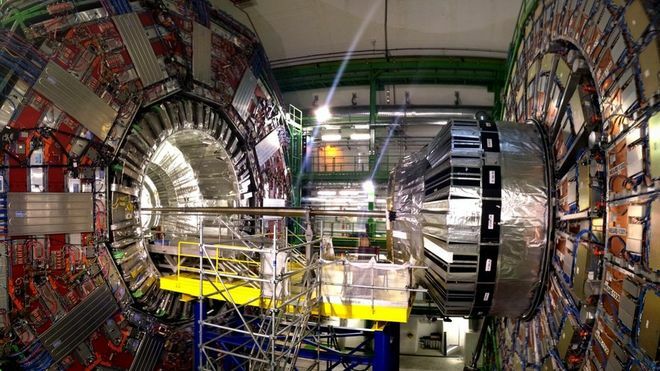 Magnetically recoverable but they did admit that this feature had never been used. The magnet did earn its keep on that trip though, recovering Terry's glasses case one day and then one of my mooring pins the next, ripped out by a boy racer on the cut. The Little Old Man likes the bright sunshine but his satnav does not. Even at maximum brightness, the screen is unreadable in bright sunlight, clearly a sunshade was needed. Mark One worked very well but that the printing on the junk mail was reflected in the windscreen. Clearly a good use for black duct tape. One of our Little Old Men has been having a rat problem. So here we see him in full rat huntin' gear...long stick, flip flop sandals and high powered anti-aircraft gun. Jim's weapon is a very famous one, this is the air rifle my father used, completely unsuccessfully, for years in his attempts to stop the depredation of squirrels and pigeons in his vegetable patch. Its new owner has carried on this family tradition of not being able to hit anything BUT he has recognised that the sights on the ordinance may have been a factor in its ineffectiveness. They are now much improved with a bit of simple LOM ingenuity. Tw is showing all the signs of become a REAL Little Old Man with yet another post from 'the castle'. As this is now a 'two bike' family. 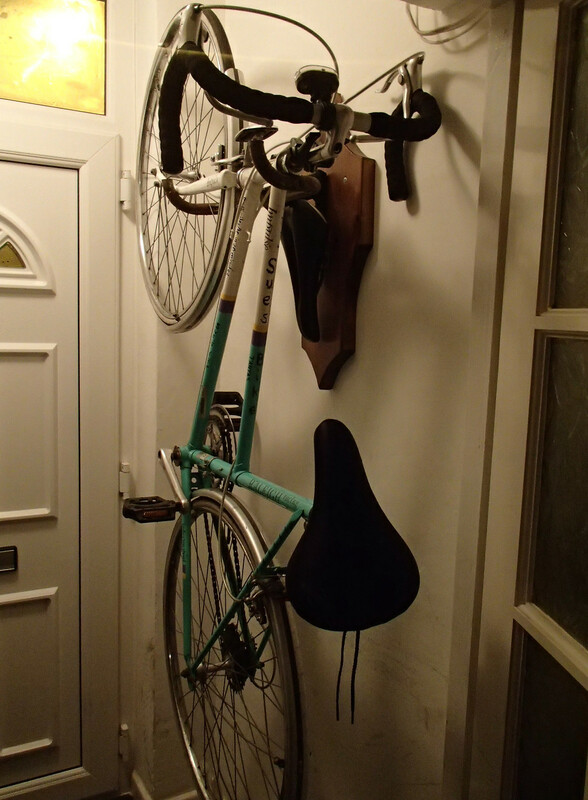 an additional place to store a bicycle has become necessary and about the only place with wall space left is the [small] front porch. Reasonably you might suppose that a redundant set of bike handlebars would do the trick as a good bike rack... well think again. In the 1950s, family holidays meant camping and we had a very substantial ex-army tent to do it. It took the combined efforts of dad and me just to lift the heavy canvas from the trailer. One year, we headed for a three week excursion to Scotland. Dad would take his full holiday entitlement for our summer break and would always enquire whether we would prefer either three weeks camping or ONLY one week in an hotel. Mother's look should have been enough to convince him to take the one week option but dad would rather have been camping for any length of time rather than staying in an hotel. So we set off for Scotland and the nearer we got the more aware we were of people returning from their Scottish holidays, this was before motorways so one was always aware of vehicles coming in the other direction on narrow single carriageway roads. [It was the custom then to wave at people driving the same make of car as yourself] Many of these returning holidaymakers bore evidence of their visits by emblems on their cars, like bunches of lucky white heather and fake flying haggisses and the like. 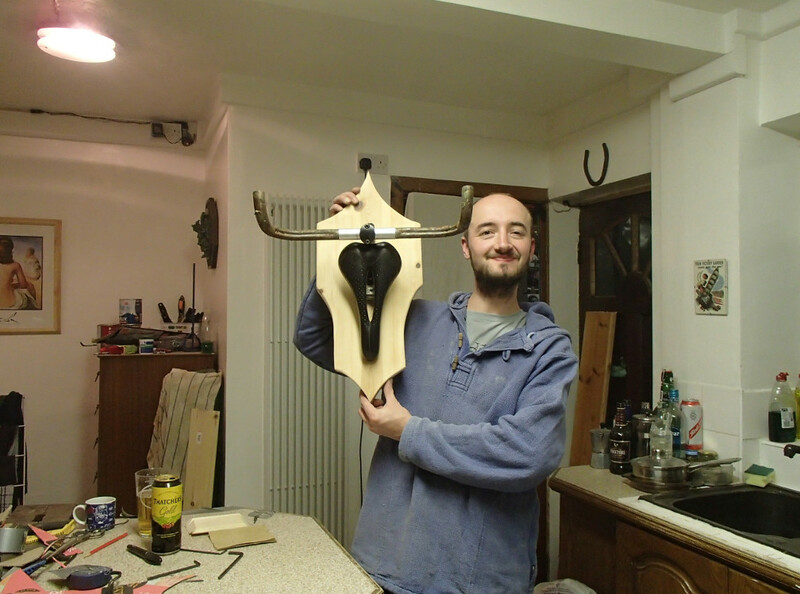 A theme though was to have some sort of deer's antler strapped to the front of the car. Observing these appurtenances provided some welcome relief to the tedious drive north. Of course, once we crossed the border, we started to look out for a suitable adornment for our car. We found plenty of antlers for sale, in antique shops and in huntin', shootin' and fishin' shops but all were beyond our modest means. 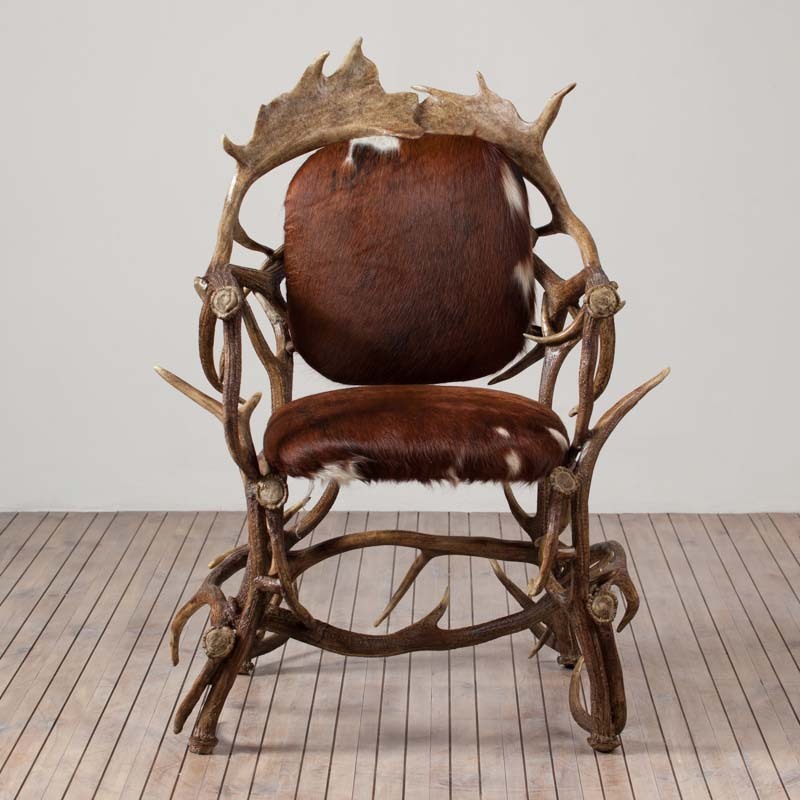 I did find however, in a back corner of an antique shop, an antler chair with moulding green upholstery and dusty antlers. I was forbidden even the slightest thought that this could accompany me home though I lusted after it tremendously. After week two it was beginning to look as though our hopes of joining the antler-be-decked cavalcade were to be thwarted, however, we were camped by the side of Loch Morlich in the Caingorms and on the day we climbed Cairngorm, we found a sheep's skull and this combined with driftwood from the loch and some [ordinary] heather from the mountainside provided our entree into the homecoming club. I have been back to Aviemore many times since then but it bears absolutely no resmblance now to how it was then. To quote from their website, linked in this paragraph, 'Aviemore is a well known and popular holiday destination with beautiful scenery and an abundance of things to do for all ages.' well when we first went there there was absolutely NOTHING to do, in the way that they mean now, but it was a beautiful and unspoiled place. 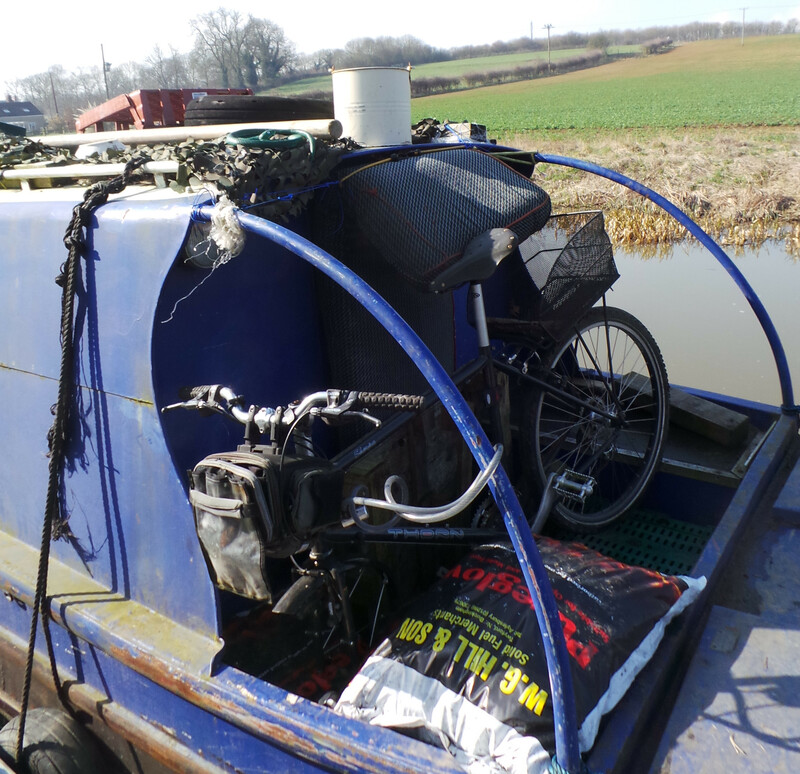 Cribbit is on the Oxford canal at the moment near to Banbury where the M40 and the canal are intertwined and the noise of the motorway is always in the background. Well, the resident Little Old Man grumbles about this but doesn't actually DO anything about it. Other Little Old Men are made of sterner stuff and take active measures to eliminate this nuisance from their lives. 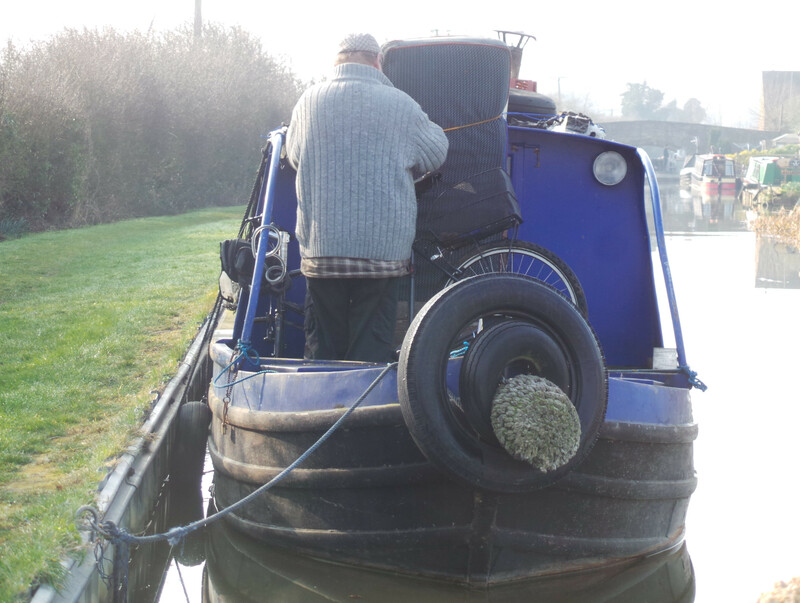 Moored up at King's Sutton, with the M40 in sight and sound, we discvered this handy innovation to keep the noise out of your boat/house/caravan. An old bed mattress held over the door with bungey straps. And as a bonus, a rare view of the Little Old Man himself. Around Halloween last year, I went over to tw's for a lecture at the university and also did a bit of tidying in his garden. Lurking in the luxurient hay meadow which passes as his lawn, I found a large, round winter squash. I collected this and put it on one of the tables on his patio. A bit later, I was busy clearing the patio when I knocked the table. Whereupon the squash malevolently rolled to the edge and jumped on an innocent bystander gnome on the ground below, smashing him to bits. Nothing for it but to sweep up the bits and make abject apologies to tw on his return. 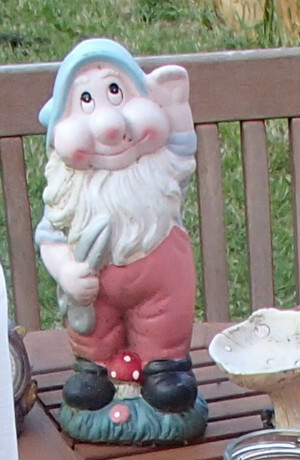 This was a sad loss as this gnome was a friendly little person and had been slowly working his way up the lawn to the house all summer. I have just been up to stay with him again and I find that the saga has moved on. 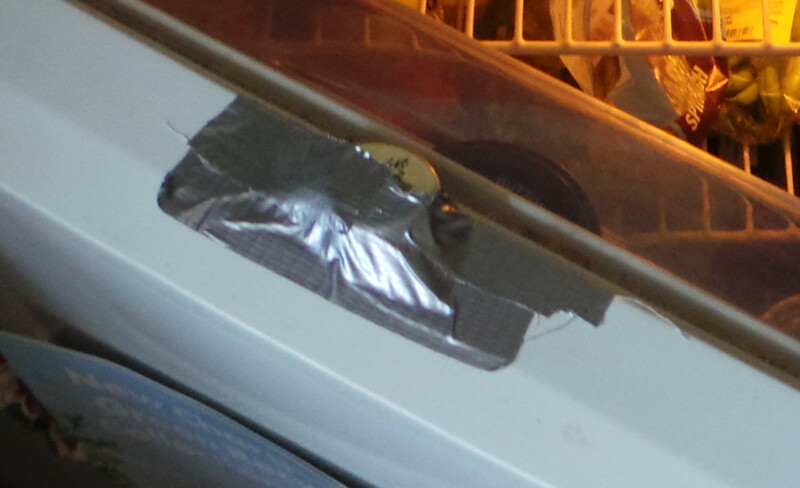 Apparently, Adham was admiring the sqash when it jumped from his hands and did its best to trash the refrigerator. Its worst depredations were halted however but not before it had manged to break the plastic moulding round the top of the door. Then Tanya moved in and suggested that replacing the interior light in the refrigerator might make it possible to see what it might be concealing. This was duly done though whomsoever thought that 50 watts was a good power specifiction for a refrigerator light is not clear to me. This small improvement led to some unexpected effects, like the arrival of a larger than expected electricity bill and the mysterious cooking of previously raw meat on the top shelf. So it was discovered that the malevolent squash had broken the mechanism to switch the interior light on and off. Of course it took some good little old man sleuthing to discover whether the modified switch was working properly, by putting the mobile phone in the refrigerator on video record mode and then shutting the door on it to see if the light went out or not or you could rent a gnome. Then a modification was needed to activate the door switch through the liberal use of Duck tape and a cider bottle crown cap. [Thank goodness Tanya drinks cider as a weakly Red Stripe ring pull would not have been up to the job. 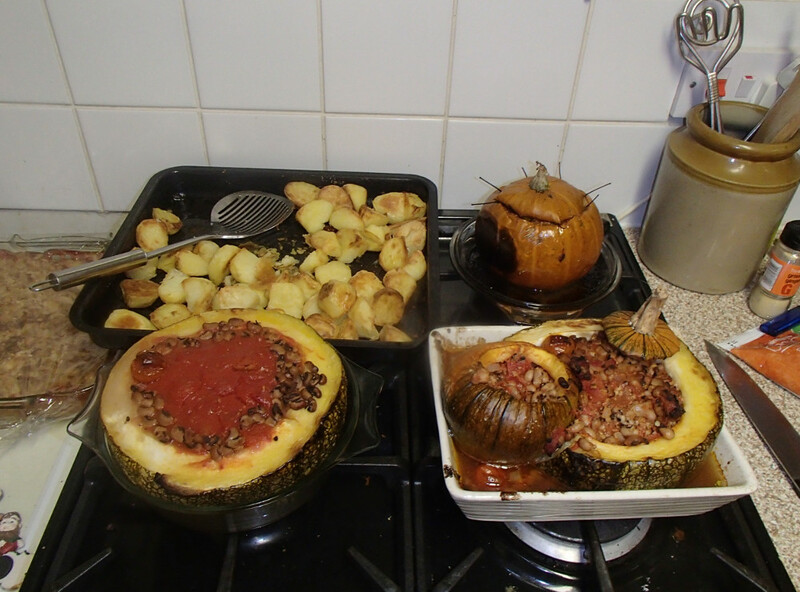 Eventually, harmony was restored and the malevolent squash was transformed into dinner.